LIVING ROOM, SOFA – How the f*^k? – The first thing is to learn how to play montunos. – To play montuno you don’t need paper. – And the musicians who have never played salsa? – It is my duty to give them all the tools necessary to satisfy the stylistic needs; videos, recordings, methods of interpretation, etc. Even be able to support them personally at the rehearsals. – Personally I think it will be difficult for them to learn to play salsa in just a few months. – It depends on the performer. And if the notation is enough clear, there should be no problem. – Are you going to write everything? – Not everything. The notation must be flexible; a constant movement between strictly written sections and others where the performer can make his own decisions. However, any of the two variables should be well represented in the paper. – Do you have an example? – How do you think I start a composition then? – I don’t know. With Notes? Lines and points. You know. 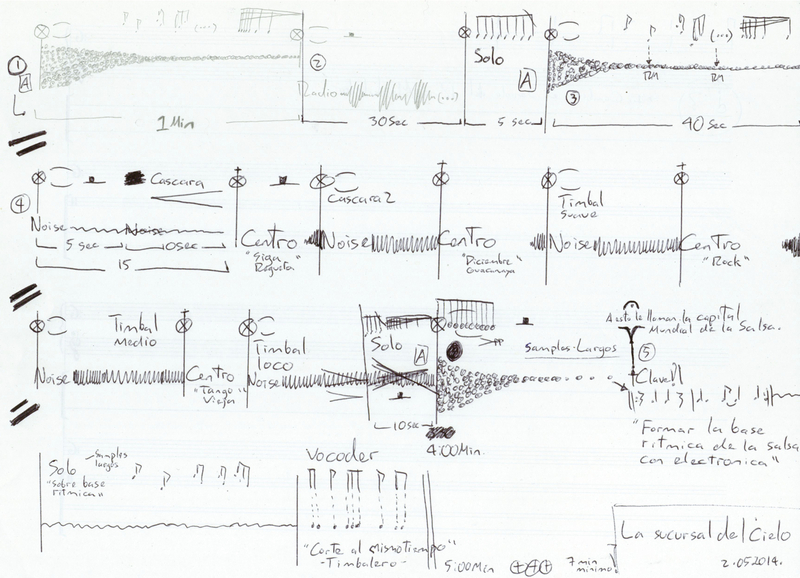 – First comes a sketch with the structure; the approximate time of each section, textures, registers and roles of each instrument. Then when the sounds together are very clear in my head, it should not take long to transcribe everything into a very clean nice score full with points and lines. – The electronics are another instrument. Look, here is noise and this RM is for ring modulation. – Generally, to know if I’m on the correct path, I do experiments with the instruments and the electronics at the same time I’m doing the sketches. Listen. – It’s difficult to know if it’s going to be exactly the same with the real instruments, the real performers, and in the place where the concert will be, but it’s good to have an idea of how the result could be.